Consumer Confidence Report 2018 - THE WATER IS SAFE! This year's report covers water quality analyses for the calendar year 2017. RWD No. 3 had NO water quality violations during 2017! RWD NO. 3 produces water from several wells. Also, some of the water is purchased the City of Seneca to serve to the area area between Seneca and Baileyville. 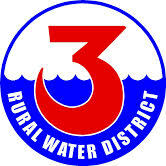 If you are not sure of which source is provided to your location, please feel free to contact the Rural Water District office to find out. Business hours are M-F 8AM to 4PM at 905 US Hwy 36 Seneca, Kansas 66538, or by phone (785) 336-3522 or email us at office@nemaharuralwater3.com. Keeping your contact information current is important so that we can successfully contact you for such things as planned service outage notifications. Selling your house, farm or land? Changing tenents? Life changes: family member, selling home, farm or land? New renters?